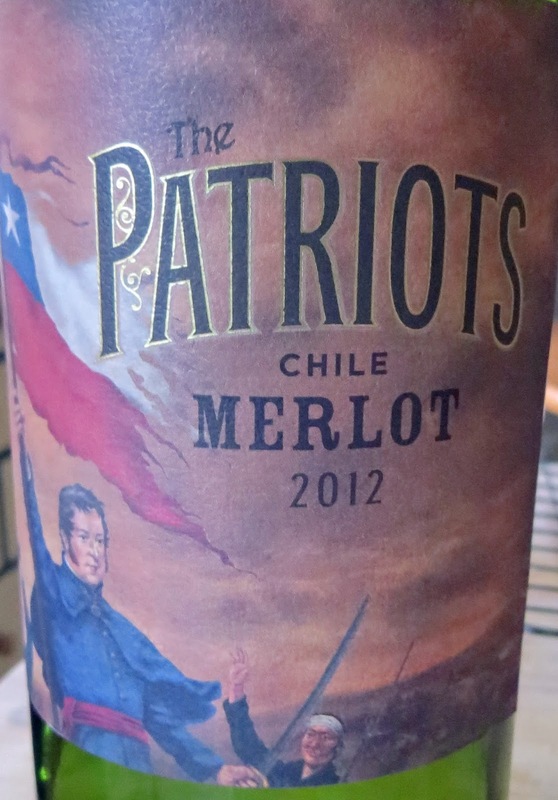 I have to concede that I wouldn’t voluntarily buy a wine that called itself OMG. It’s been quite a while since I was a 14 year old girl so I tend not to say or type OMG terribly often. I’m not quite sure that the message is meant to be. 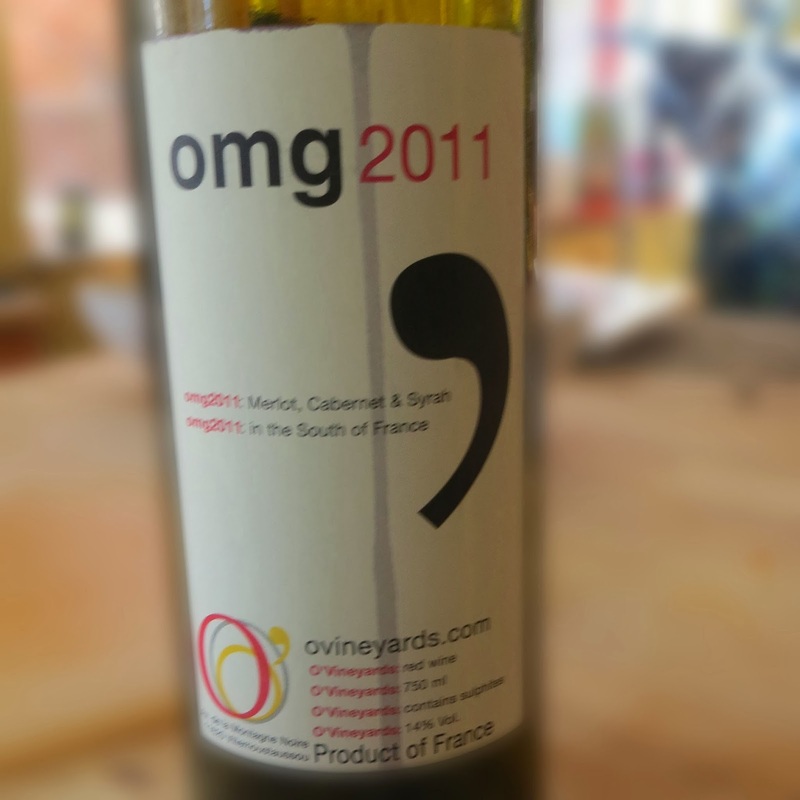 The wine makers are O’Connells so they’re playing on the ‘O’ thing, but it’s not working for me. I got a bottle as part of a mixed case, so I didn’t choose it, and the label made me think “party wine” rather than “nice bottle”. 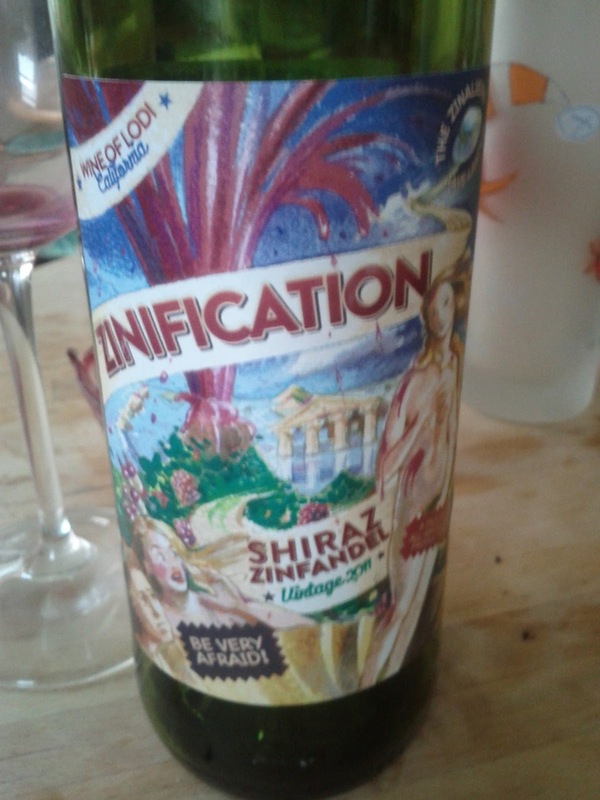 That said, the wine isn’t as tacky as the name suggests. It’s thick and dark and purple. It’s fairly lively straight out of the bottle and benefited from a half hour’s rest. It smells of blackcurrants and pepper. There’s a good hit of acid, again, softened after a little time to relax in a decanter. It’s spicy and has quite a mouthfeel. It felt a little bigger than the 14% on the label. It’s certainly not a light easy drinking wine, there’s plenty fighting for attention between the fruit, alcohol acid and spice. For me it was a bit too much, those elements were all muscling each other around at the same time and didn’t really settle into one integrated drink. It costs about £8 from Naked Wines, look out for Naked Wines’ Latest Offer. I just spent a few days in Lisbon, Portugal. I recommend you do too, it’s a great city that really underplays its hand. There’s oodles of history, fantastic galleries, cool people, great bars and the most divine seafood. There’s plenty of fabulous wine too. Vinho Verde was everywhere, at all sorts of price points, and it was good. It’s always tricky to fairly assess any wine you drink on holiday, when you’re drinking wines in the country or region in which they’re made, when you’re relaxed and having a good time. All of that holiday feeling goes into the wine, and some that taste fantastic in a little family restaurant on a European hillside are just plain weird when drunk at home. 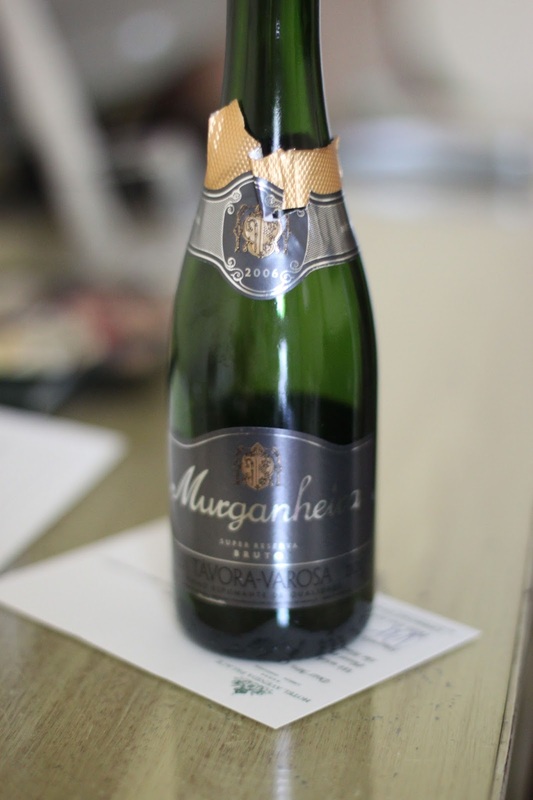 We had some Murganheira Superior Reserve Brut 2006. I’m not normally one for drinking wine in a hotel on holiday, because there’s too much world out there to explore, but the good people at the Hotel Avenida Palace had left a lovely note in our room inviting us to enjoy half a bottle on them, so we did. I didn’t expect much from a freebie, and I’ll be honest, I’d never tried a Portugese sparkling wine before, and I never find that half bottles taste as good as a full bottle, so I was pleasantly surprised by this one. It was nutty and crisp and a tad more-ish, which was a shame with a half bottle. It had a Champagne style of flavour, but with just a bit more of a savoury character if such a thing is possible. I’ll look out for it again to give it a fairer comparison on a dull and drizzly day in the suburbs. This Holiday Season, Drink Farmer Fizz! This wine has a silly label. Not normally a good sign, it looks like it’s designed to appeal to people who don’t much care for wine but want something to serve at a 4th of July barbecue. That said, they could be on to something, as that wouldn’t be a bad place for this wine to end its days. It’s a bold purple colour fresh out of the bottle, and it has an interesting smell. There’s plum, and a little cherry, along with something of the forest floor, a bit of kicked around leaves if tat’s a real smell. The first taste is arresting. It’s rather sharp, a little too acidic for the body of the wine to carry, with a mix of firm ripe tannins and some that haven’t quite made the journey to ripe. Left aside for half an hour to relax, breathe and give itself a good talking to, it’s a much better wine. Maybe my evening was getting better, but it felt like it had pulled itself together a little. The acid wasn’t as noticeable and the flavour seemed more robust. There was fruit, but the curious sharpness seemed to settle into more of a warming spiciness. Still more chilli than pepper, it all seemed to work together much better. I’d have this wine again, but next time I’d probably decant it. Not something I’ll do regularly for an everyday wine choice, but I think the uplift in flavour for this one it’s worth it. Pizza Night with Red Rooster’s 2010 Merlot! Here’s the thing, there isn’t a nearby Aldi where I live, but I’d heard interesting things. People told me that Aldi had great Italian cheeses at absurdly low prices, easily available bottled cherries, canned pumpkin and fish pates. Whilst Aldi have been advertising that you can get all of the products you can buy in a traditional supermarket, but at lower prices if you don’t mind unfamiliar brands, they’d forgotten to advertise to me. I don’t much like supermarkets, so the chance to go to a smaller, busier one with bargain hunters didn’t appeal, however, when I heard people describing what sounded like a great European deli, with a cheap line in staples I gave it a go. I behaved irrationally. I bought all sorts of oddities. The single serve Camembert in breadcrumbs seemed like a good idea at the time, the strange packaged cous cous really was a good idea. The Greek seasoning mix hasn’t yet been samples, but the bottled cherries and tomatoes were a hit. I was baffled by the booze aisle. There was some fairly grim looking stuff, but up on the higher shelves, looking alarmingly dusty, was an interesting looking selection, with Fleurie, Champagne, Bordeaux and what looked like an array of Languedoc wines which could have gone either way. 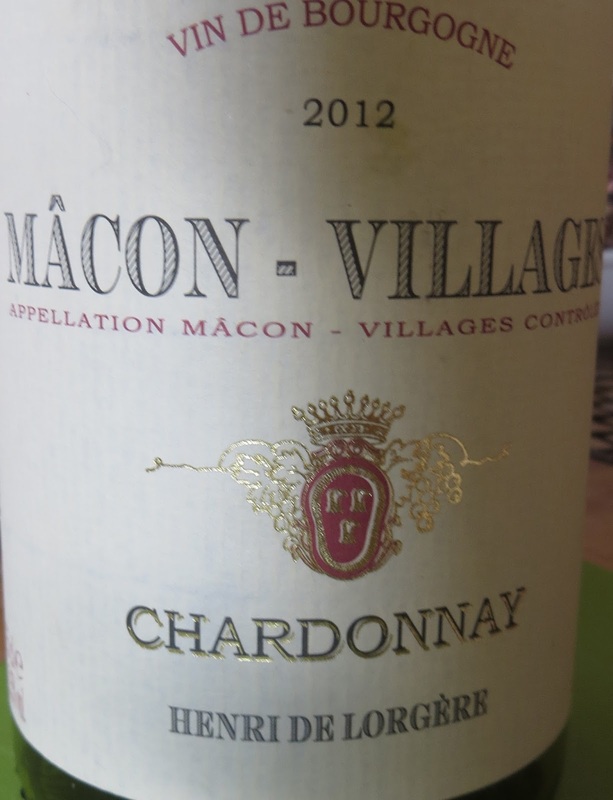 I thought I’d ease in gently and try a Macon Villages for under a fiver. I was pleasantly surprised. It was good, at least as good as wines that cost 50% more. It smelled rich and creamy, and it had a good hit of lemony acidity, it was drinkable to a distinctly more-ish degree. Next time I’m passing I’ll stop in and try some other wines, and if they work as well, I may even make a detour to shop there on purpose. Want to know how to shop on a budget? Aldi. Go shop at Aldi. A curious thing has been happening in England over the last month. It’s been sunny, not just sunshine and showers, but so sunny it’s been too hot. Temperatures in the 30’s, day after day, with little rain, and that coming only in short sharp bursts. It’s very odd, we British don’t know what to make of it. I suspect the Italians are more used to this sort of weather, particularly those down in Puglia, the “heel” of Italy, so they’ve had more of a chance to think about how to behave, and what to serve under such circumstances. They’ve had time to grow these Fiano grapes and turn them into wine for just such sultry evenings. 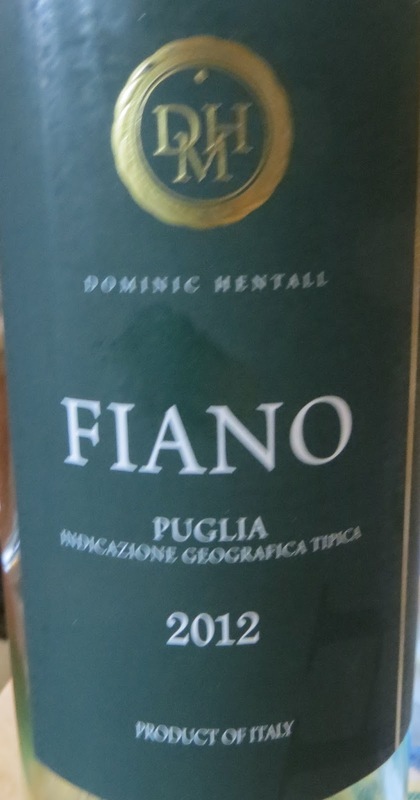 This is a fresh and excitable variation on Fiano, no careful aging here, it almost tastes of grapes.There’s a bit of peach blossom, and lots of squishy soft fruit, but with something that may even be a mineral zip to keep it from feeling flabby. Resist the temptation to chill it til it hurts, as that will chill the flavour clean out of it. Do put a second bottle straight into the fridge when you take one out, you may want another real soon as it’s dangerously gluggable. Get a half price Naked taster case. I’ll admit I’m not a White Zinfandel fan. It strikes me as a waste of good Zinfandel. It seems a shame that the UK imports lots of cheap, sweet, thin White Zinfandel and next to no scrummy fruity proper Zinfandel. Never mind, we can get Primitivo from Italy, so we’re OK. This White Zinfandel runs the risk of being extra horrid because it has both a silly name and a comedy label, usually two sure fire routes to disaster, but it was actually pretty good. I say that with some caveats, but compared to your average American Pinko, I rather liked it. Maybe the sun is getting to me. It’s a cheery pink, but it smells of actual strawberries and redcurrants, rather than a 1970’s Angel Delight candified re-imagining of what fruit might taste like if it was possible to create it in a factory. It’s not offensively sweet, and whilst no-one would accuse it of being acidic, it does have enough acid to carry the fruit. If you’re looking for a cheerful summer pink, that has some fun factor, and isn’t horrible, this could be the wine for you. I like Italian wines, and I’m not afraid to admit it. 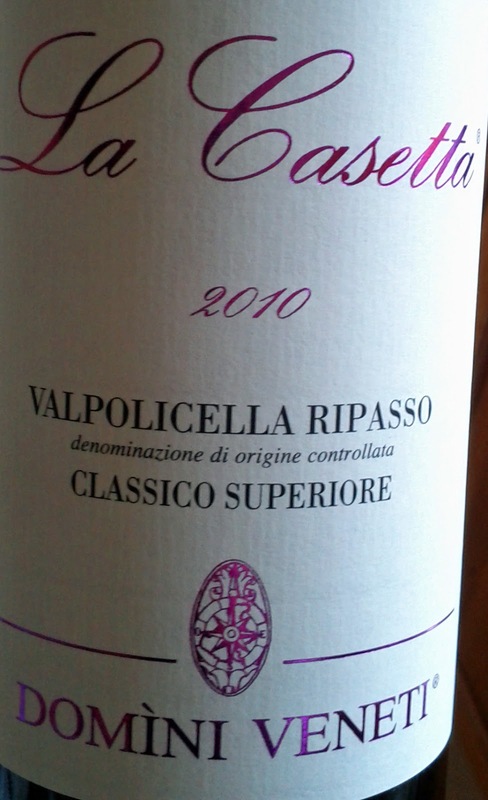 I love Valpolicello’s fruity exuberance, and the Ripasso is theoretically it’s more mature, grown up sibling. Re-fermented on leftover grape skins and goo the alcohol content goes up, and there’s just a little bit more, well, everything. This is a rich dark red, bordering on purple. It has strong legs and a wonderful smell, like cherry pop served next to a cinnamon bun. Fortunately the flavour is a little different. Its dry, with firm tannins. The alcohol level is up there at 14% but it sits nicely in the wine and doesn’t feel overpowering, it just adds to the body. The fresh cherries from the aroma turn in to a more dried version in the mouth, with a raisin-like taste. The spice is still there, along with an aged wood flavour. This wine was from Majestic and priced at £14, but with a standard buy two, save £2 per bottle type deal, and I thought it was fairly priced. 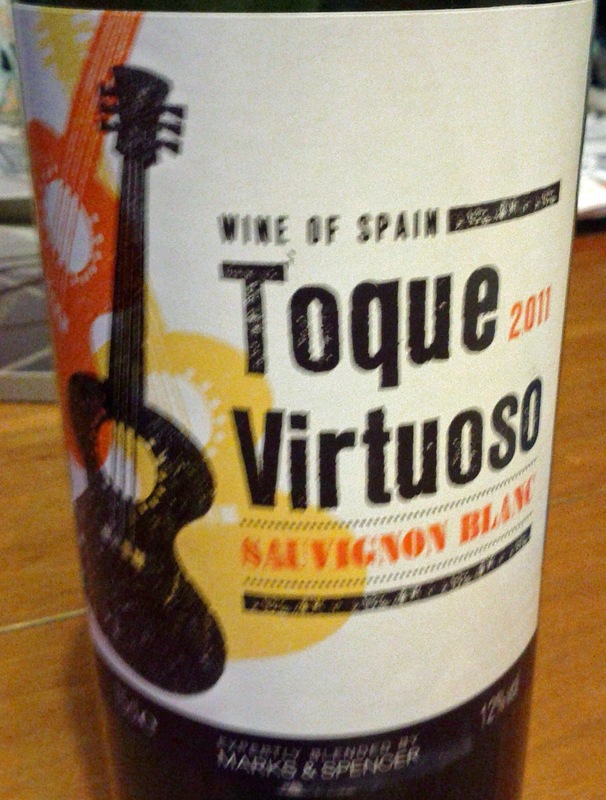 I loved the label on this wine, everyone looks so cheerful as they sing and play guitar and wave their walking stick in the air. Surely this wine could cheer anyone up, if not cure the lame. It comes from a Fair Trade co-op in Chile, so you can rest assured there’s no indentured labourers being sprayed with pesticides in the middle of the day. Oddly, I don’t think about that much, except when a wine has Fair Trade on the label. Perhaps unfair trade suppliers should have a variation of the logo with a crying man in red and orange rather than the happy waving chap in Fair Trade Land, that would help me make better decisions. La Fonda Cabernet Carmenere smelled good, with plums and blackcurrants. It was dry, with some firm tannins, along with some that could best be described as robust, or maybe rustic. There was a definite green-ness in there from the Carmenere. This wasn’t my favourite wine, but Carmenere isn’t my favourite grape, so I didn’t expect it to be, but for a Cabernet Carmenere blend it was pretty good, and if you enjoy that tannin hit, then you’ll love it. This bottle caused some confusion at home. Was it ours? Did someone buy it? Was it something that someone brought for a party but didn’t drink? Was it a bottle bought by the kids and accidentally mixed in with the general supply? Nobody admitted buying it or knowing where it came from, but t was cold from the fridge so we opened it, very gingerly. I’m not a wine snob, but this one did set even my snootiness alarm bells going. 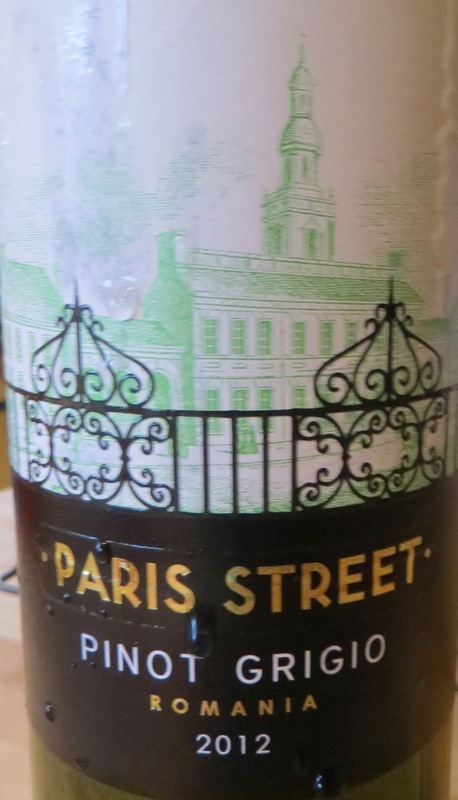 Why would you call you wine “Paris Street” if it came from Romania. What kind of trick are you trying to pull? It’s not even as though it’s a French grape. “Venice Piazza” would make a bit more sense. I guess they hadn’t figured out how the teenage girl market might go wild for “Transylvanian Thoroughfare”. It smelled vaguely of wine, in the way that most Pinot Grigio’s do. I didn’t have a lot of hope, but it wasn’t bad. It had a hint of fruit, and would pass for an Italian example. It’s not a fabulous wine, and I wouldn’t knowingly pay the £7.50 list price for it, but it came in a Laithwaites bundle so I suspect a more realistic high street price would be £5. What does disappoint me is the lack of pride and ambition from its Romanian makers. This wine is as good as many Italian and French mass market wines, or any new world wines at a similar price point. It’s only notable feature is that it is Romanian, so make that your USP. Stick a vampire on it if you must, but better still give it a geographical name and a text only label and get out there and promote your Romanian wines with pride. The sun has got his hat on, hip hip hip hooray, the sun has got his hat on and it’s pink wine all the way. OK so I don’t always wait for the sun to get dressed up before opening a bottle of pink, but once the hat has been deployed, I have an extra excuse. Spanish pinks from Rioja have the advantage of added man-appeal. There’s nothing girlie about a rosado, men come into bars in Northern Spain and order a small rosado with a little tapas in much the same way as a bloke would order a shandy and a bag of crisps. 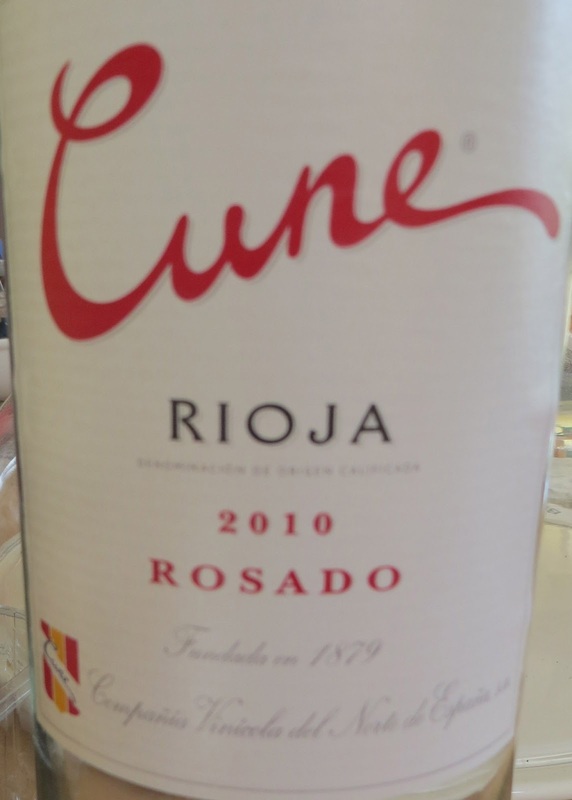 This Rioja Rosado is best served very cod to make the most of it. This also gives you the advantage of condensation on the glass making the rich pink colouring look extra lovely. It has a crisp acidity and a sensible alcohol level, and it’s dry – none of your white zinfandel strawberry soda nonsense here. The flavour is more redcurrants and raspberries. There’s a tiny bit of strawberry jelly, but not an overwhelming amount. We had it with grilled tuna and a scrummy quinoa tabbouleh, and it worked well, even if it was too cold to eat outside, even with blankets. Expect to pay around £7-8 a bottle, expect to see me buying more. I may not own a pink accessory or item of clothing, but I like to make up for the deficit with pink wine. 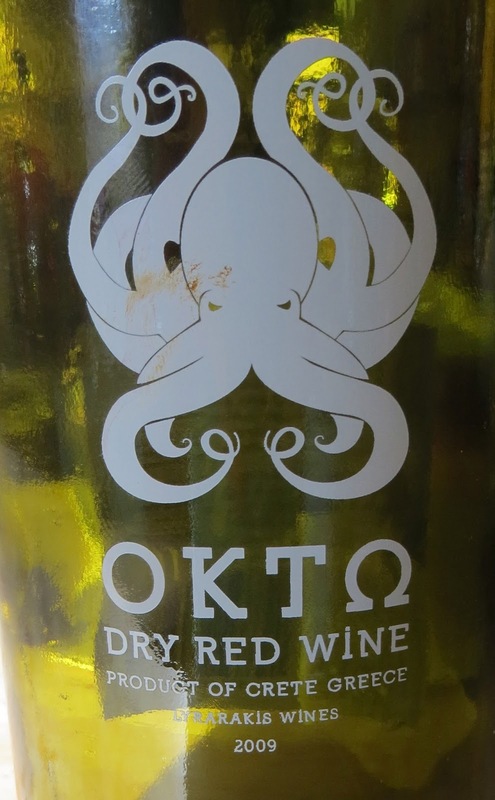 I admit, I bought this wine because I just couldn’t resist it, with the cheery octopus print on the bottle. It’s Greek, so we had it with a lovely Mediterranean falafal flatbread salad. It seemed like a good way to support the people of Greece in their time of austerity. I’ve had some truly awful Greek wines and some utterly sublime ones, however, like all wine I suspect this one tastes best in its homeland, specifically Crete. My budget didn’t run to that so we drank it in the kitchen. It smelled almost like a Cotes du Rhone than had run off to join the circus, and ended up in Italy. There was fresh juicy red cherries and dark plums as well as a peppery spice. There was a good hit of ripe tannins, along with some a little firmer. It was dry, but with a sweet fruitiness, and a lively acidity. I liked it, but it seemed to be doing a few different things at the same time, and wasn’t quite together. I suspect it would have been best drunk last year when I bought it, but it’s been lying around, waiting for something to happen, Greek economy style. At about £10 a bottle it’s OK, but not great, although I suspect if I drank it with some stewed squid, watching the sun go down on a terrace in Crete it would be the nectar of the Gods. A rainy night in the English Midlands could never really do it justice. 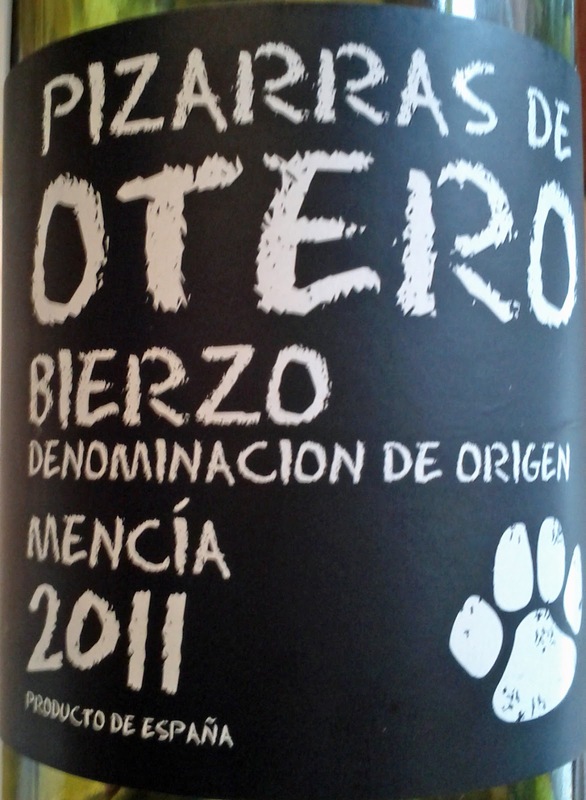 I bought this wine for no better reason than I recognised Bierzo from Villafranca del Bierzo, a beautiful town we’d cycled through on the Camino de Santiago. I have vague memories of the vineyards around the town, but my strongest recollection is having been really ill the day before, and not wanting to eat anything in case of emergency. Lycra really is not your friend if you have to make an emergency bathroom stop. The wine was a rich, thick, deep red. It smelled of dark autumn fruits with a little herbiness, almost as though it was from the south of France. The dark fruits continued when I tasted it, along with something more like cherries, and strangely, just a touch of Bovril. I know that should be a bad thing, the taste of boiled up bovine carcass remains, but it was actually quite positive, I suppose a kinder description would be Marmite, but really, it was Bovril. At £7 from Majestic I thought this was quite a bargain, as you wouldn’t feel you were wasting it taking it along to a barbecue, but you could really enjoy a bottle with a rich tomatoey spaghetti meal, and its Bovriliness would no doubt accompany meat well. Not all of the impulse purchases of wine I make just because I’ve cycled through the vineyards go well, but this one certainly did. 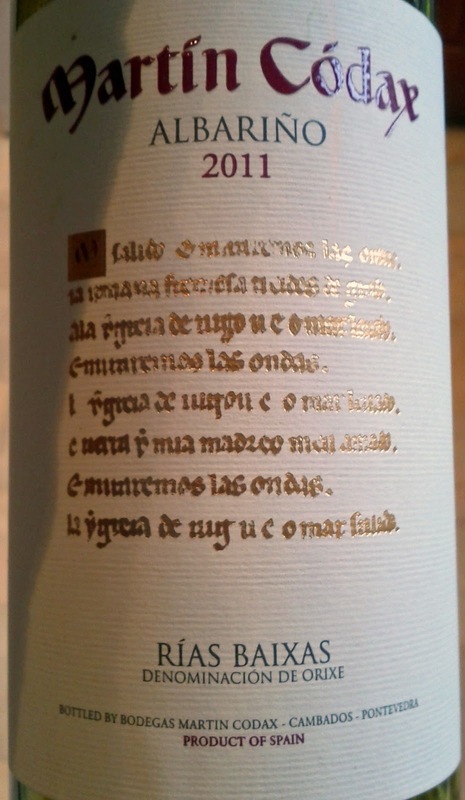 I didn’t hold that against the wine though, I was keen to try it, and this example comes from the good people at Bodegas Martín Códax who make a nice Albarino another day’s ride down the road towards the Atlantic Ocean. I developed a taste for Albariño in Galicia when I completed the Camino de Santiago by bike in 2003. It did give the wine an unfair advantage, being the drink I celebrated the fact that I no longer had to cycle every day during the hottest summer ever recorded in Europe, but I like to think it was just that it’s really good wine that’s flavoursome and refreshing. The Martin Codax brand is a reliable source. They opt for a clean fresh varietal approach, no messing, no blending, no aging, no oaking. They ferment the wine, let it sit around in its own residue for a bit, bottle it and ship it. There’s sometimes the very slightest hint of pettilance, but that sits well with its acidity, bringing that citrus flavours to life, without overwhelming the soft green herbiness and sweet peachy goodness within. The alcohol level is about 13% so it’s easy drinking and won’t knock your socks off if you want a second glass, or a third if you’ve been out on your bike all day, just don’t get back on the bike afterwards. This wine has for me a very firm sense of place, it reflects the cooler shores of north west Spain, rather than the summer heat of Rioja and Navarra, it’s fresher, lighter, but just as good. Majestic carry it for about £12, but it’s usually available on offer or in some sort of multibuy for £10. It was Eurovision final night last night, so like every right thinking European we printed out our superfan score sheets, stocked up on snacks, turned our taste-o-meters down to zero and settled in for a night of weird and wonderful entertainment. As the contest took place in Malmo this year, we couldn’t drink host-country wine, so we celebrated Vincenzo Nibali’s excellent form in the Giro with an Italian wine instead. Greco comes from the area around the bay of Naples, where it is hot, but the people are cool. Italy’s Eurovision entry appeared to be cheating – they’d entered a sharp dressed handsome man singing a well written pop song – no wacky dancers, curious instruments or wardrobe malfunctions. What is the Eurovision world coming to? The wine itself was good. A pale colour, smelling of sweet fruit blossoms. It was crisply dry, with a much fuller body than I’d anticipated. The sweet blossom had a honey tinge which sat nicely with the squishy ripe peach flavour of the wine, which lasted well. gardens, with only a slight squelch underfoot. Plants are growing and weeds are thriving. For some reason this time of year puts me in the mood for Beaujolais. It may be because Deboeuf has trained me with his Flower Labels to equate blooming with buying Beaujolais, but I prefer to think it’s because Beaujolais expresses springtime with every swig. 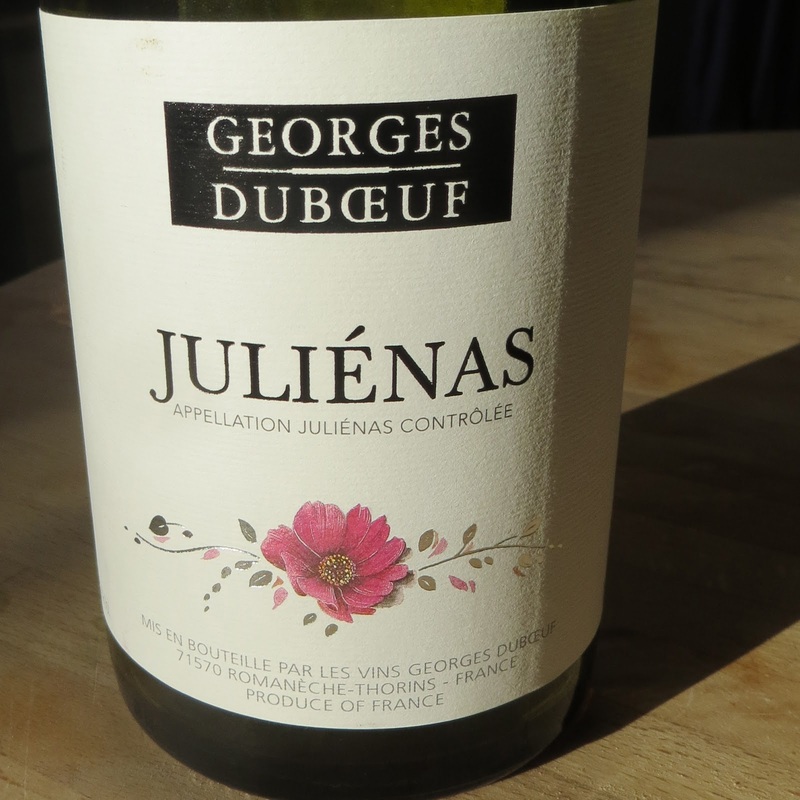 Juliénas adds that extra touch of romance by claiming that it’s the region where the Romans first planted vines in Beaujolais, naming the area after Julias Caesar. I’m a sucker for historical links to wine. This one is sweet, well, it’s not dry, and its not actually sweet, but for a European red it’s pretty sweet. It’s a full on fruit bomb of fresh berries squished up with some blossom still attached, but not in a sickly kind of way. There’s something quite grown up in there, spicy to an almost festive degree. For £9 this is a good buy. I’ll buy more. I have a confession to make, I love Zinfandel. Sadly if you say that in England people may think you mean White Zinfandel, the wine of choice for people who don’t much care for wine, but will drink it if it tastes more like a still strawberry alco-pop. Red Zinfandel can be heavenly, but it grows in California. Whilst I may pray for rain in California so the grapes can grow and they can make more wine it won’t do me much good. By the time wine has been made and shipped across the USA and then across the Atlantic, and then had import duties, excise duties and taxes added, even the most mundane Zinfandel can be prohibitively expensive. This bottle has a fun label. That’s rarely a good sign, and had me fearing that it may be aiming for the White Zinfandel crowd. It’s a rich dark red, and it smells, well, like Shiraz really. It’s a bit more blackberries than raspberries, and the spice is perhaps deeper than the light black pepper tang I’d hoped for. If there was a Venn diagram of pure Shiraz and pure Zinfandel I guess this would just about pass for a warm climate over extracted Zinfandel of rich black pepper and super ripe blackberries and blackcurrants, but I suspect that’s all coming from the Shiraz, there doesn’t seem to be much of the lighter, fun raspberry fruitiness of a scrumdiddlyumptious cooler weather, lower yield, lovingly crafted Zinfandel, but hey, I paid less than a tenner for the bottle, it came with a fun label, and it tasted pretty good. It is perhaps my fault that I had excessively high hopes for the bottle, not the wine’s fault for not being something entirely different. I’ll try and keep my Zinfandel cravings in check til I’m next in the USA, I’ll only be disappointed or bankrupted otherwise. Advertisement: £40 off a case of Virgin Wine. You choose the wines, get £40 off a case. Another weekend, another Marks & Spencer ‘Dine In’ offer, although the offer that this wine came with was a few weeks ago. I have a confession to make – I don’t always drink the wine that comes bundled with the meal offer with the meal bundle. I tend not to think ‘Spain’ when looking for a Sauvignon Blanc. I think of the cool hillsides in the Loire I’ve cycled through where the Sauvignon Blanc grows in the rain, or what I imagine to be similar sites in New Zealand. Spain just seems too sunny for Sauvignon. Blanc. The difference did come through in this wine, it was dry, but with less acidic bite than I might expect from a classic Sauvignon Blanc. The feel was rather smooth, and the flavour more tropical than a typical example, although rather sparse, more light rain on a mango tree rather than cat’s pee on a gooseberry bush. It wasn’t my favourite, but it was pleasant enough and unlikely to offend anyone. Perhaps the 70’s style label should have given me a clue, it was wine for people who are willing to give wine a go but don’t want anything too winey.